B.Tech. 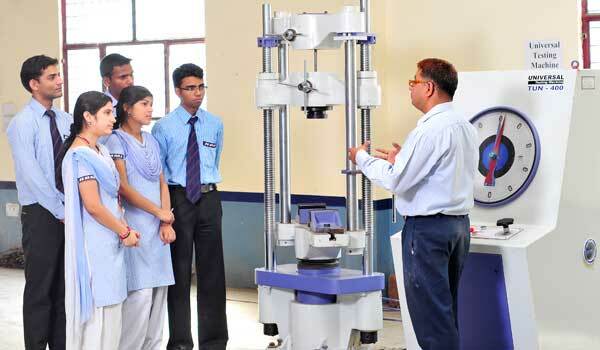 in MECHANICAL ENGINEERING is a four years full time graduate degree programme, comprising two semester each year. The program is approved by AICTE and affiliated to Dr. A.P.J. Abdul Kalam Technical University, Uttar Pradesh, Lucknow. The department strives to impart quality education keeping in view the Global scenario and social obligation. The department strives for continuous improvement in quality of education through curriculum development and upgradation of laboratories. Mechanical Engineering is considered to be more traditional engineering domain with its roots firmly placed in heavy manufacturing industries like automobiles, mining, steel, metal and forging. Despite being one of the oldest engineering domains, Mechanical engineers still find diverse range of job opportunities in a variety of industrial sectors ranging, including a few new ones dealing with computer technology and robotics. In the Indian context, mechanical engineers are known to find great employment offers in the public sector over the private ones. This trend is changing rapidly, but government agencies still remain one of the most preferred employers for mechanical engineers. Public sector heavy industries like Indian Railways, Defence Forces, national highway authority, metro rail corporations, shipyards, ports and others are known to hire qualified and trained mechanical engineers. In India Mechanical engineering students from premium institutes are offered handsome packages, owing to their academic excellence and skill set.